Plasmacytoid dendritic cells (PDCs) are capable of presenting Ags to T cells in a tolerogenic or immunogenic manner depending on the formulation of the Ag and the mode of stimulation. It has not been investigated whether effective adaptive immune responses useful for vaccination can be induced by Ab-mediated Ag targeting to PDCs in vivo. In this study, we show that Ag delivered to murine PDCs via bone marrow stromal cell Ag 2 (BST2)/CD317 in combination with TLR agonists as adjuvants is specifically presented by PDCs in vivo and elicits strong cellular and humoral immune responses. These include IFN-γ production by CD4+ T cells and high Ab titers with a broad range of IgG isotypes. In addition, BST2-mediated Ag delivery in the presence of polyinosinic-polycytidylic acid as adjuvant induces cytotoxic T lymphocytes that are functional in vivo. A single immunization with Ag-fused anti-BST2 Ab together with polyinosinic-polycytidylic acid as adjuvant is sufficient to trigger protective immunity against subsequent viral infection and tumor growth. We conclude that despite the potential tolerogenic properties of PDCs, Ag targeting to PDCs in combination with TLR agonists as adjuvants is an effective vaccination strategy. Dendritic cells (DCs) are considered to be the ideal target cells for vaccines. They are pivotal in initiating immune responses to foreign Ags due to their unique efficiency in taking up, processing, and presenting Ags on MHC class I and II molecules. In addition, DCs respond to a wide variety of pattern recognition receptor ligands, which determine the strength and quality of the elicited adaptive immune response. The type of immune response that is induced by DCs depends on the DC subtype that presents the Ag as well as the tissue microenvironment that modulates the DC function (1, 2). Rational vaccine design can be achieved by Ab-mediated Ag targeting to specific DC subpopulations in combination with suitable adjuvant to elicit the desired type of adaptive immune response (3). This approach has been tested extensively in the murine system to target Ags specifically to conventional DC (CDC) subpopulations. Ag delivery to CD8α+ CDCs via DEC205 (4–8) or CLEC9a/DNGR-1 (9, 10) in the presence of adjuvant overcomes tolerance and induces effective CD4+ T cell and Ab responses as well as CD8+ T cell responses, as CD8α+ DCs are highly efficient in cross-presenting exogenous Ag. CD8α− CD11b+ CDCs have also been targeted successfully leading to preferential expansion of CD4+ T cells and induction of humoral immune responses (6, 11–13). In the human system, Abs directed against DEC205, DC-SIGN, DCIR, and the mannose receptor were shown to be capable of targeting Ag to human DCs and to trigger CD4+ and CD8+ T cell responses in vitro (3, 11, 12). Data on Ag targeting specifically to plasmacytoid DCs (PDCs) is rather limited to date. Siglec-H and bone marrow stromal cell Ag 2 (BST2) have been shown to be specifically expressed in murine PDCs (14, 15) and to be able to deliver Ags to PDCs for presentation (16, 17). The C-type lectin BDCA-2 expressed on human PDCs can mediate Ag presentation to T cells in vitro (18). PDCs, which are at the front line of antiviral immune responses because of their capacity to produce high amounts of type I IFN, differ considerably from CDCs with regard to Ag presentation. Whereas CDCs shut down the formation of new peptide–MHC class II (MHC II) complexes upon activation and stabilize high levels of peptide–MHC II complexes on the cell surface for a long time (19), activated PDCs have a high turnover of peptide–MHC II complexes. They may therefore be specialized to present Ags, which are available for MHC II loading for longer time periods (such as in viral infection), whereas they are rather poor at presenting soluble Ags (20, 21). However, presentation of exogenous Ags to CD4+ T cells in vitro can be achieved by Ag delivery to human PDCs via FcγRIIA (22) or DCIR, for example (23). PDCs have also been demonstrated to cross-present viral Ags derived from infected cells or directly from viral particles to CD8+ T cells in vitro (24–26), although it is still controversial if this also occurs in vivo (20). The data that are available to date show that Ag presentation by PDCs can induce both T cell-mediated tolerance (27–30) and immunity (18, 23–26). The outcome of Ag delivery to PDCs in vivo with regard to the type of T cell response that is induced is therefore not predictable and is likely to depend on the route of Ag delivery and the mode of stimulation. In the human system, PDCs constitute a major DC subpopulation in contrast to the equivalent of murine CD8α+ DCs, the CD141+ XCR1+ DCs, which have only a very low frequency (31–33). In addition, PDCs are directly activated by TLR7 and TLR9 ligands as adjuvant. Thus, PDCs may be attractive target cells for vaccination, if their tolerogenic properties can be reversed. In this study, we investigate the efficacy of Ag targeting to PDCs (via the specific surface molecule BST2) for eliciting protective adaptive immune responses in vivo. We show that Ag delivery to murine PDCs via BST2 in the presence of CpG 1668 or polyinosinic-polycytidylic acid (polyI:C) as adjuvant is specific and efficient in inducing a Th1 response and high titers of class switched Abs including IgG1, IgG2b, and IgG2c. In addition, in combination with polyI:C as adjuvant, BST2-mediated Ag delivery to PDCs is potent in inducing CTLs that are functional in vivo. We show that a single immunization with a recombinant anti-BST2–Ag fusion protein together with polyI:C provides long-lasting protection against subsequent viral challenge and inhibits growth of an aggressive Ag-expressing tumor. Specific pathogen-free, 6- to 8-wk-old, female C57BL/6 and C3H mice were purchased from Harlan Winkelmann (Borchen, Germany). OT-I and OT-II mice (C57BL/6) were bred under specific pathogen-free conditions according to the institute’s guidelines. Experiments were performed in accordance with German animal care and ethics legislation and were approved by the local government authorities. RNA was isolated from a hybridoma cell line that produces anti-BST2 Ab (rat IgG1) using TRIzol reagent (Invitrogen, Karlsruhe, Germany) (14). The sequences encoding for the V region of the L and H chain were amplified from cDNA using the 5′-RACE amplification system (Invitrogen) and cloned into a previously described vector encoding for a mouse IgG1 Ab whose C terminus is fused to full-length OVA (34). Because of a mutation in the Fc part, this recombinant Ab is unable to bind to Fc receptors. Where indicated, a peptide of hen egg lysozyme (pHEL) was used as Ag. The anti-BST2–pHEL Ab was generated by replacing the sequence encoding for OVA with the sequence encoding for pHEL (aa 48–62, DGSTDYGILQINSR). The chimeric PDC-specific Abs were transiently expressed in HEK293T cells and purified from the supernatants using HiTrap Protein G columns (GE Healthcare, Munich, Germany). Each batch was tested for binding to PDCs by FACS analysis. For FACS analysis, cells were stained using Abs against CD3, CD4, CD8, CD86, IFN-γ, IL-2, IL-4, anti-mouse IgG1 (BD Biosciences, Heidelberg, Germany), CD11c, CCR9 (eBioscience, San Diego, CA) and B220 (Southern Biotech, Birmingham, AL). 120G8 and 440c Abs were produced and FITC-labeled or biotinylated in our laboratory. The biotinylated Aw3.18 Ab was a kind gift of Diana Dudziak (Friedrich-Alexander-University, Erlangen-Nürnberg, Erlangen, Germany). Propidium iodide (Sigma, St. Louis, MO) was added to exclude dead cells from the analysis. For intracellular staining, cells were fixed with 2% paraformaldehyde, permeabilized with 0.5% saponin buffer, and stained with fluorescently labeled anti–IFN-γ, anti–IL-4, and anti–IL-2 Abs (BD Biosciences). Cells were analyzed on a FACSCalibur flow cytometer (BD Biosciences) and a Gallios flow cytometer (Beckman Coulter, Krefeld, Germany). To investigate Ag presentation directly ex vivo, C3H mice were immunized i.p. with 20 μg of the Ab–pHEL fusion proteins in combination with either PBS, 10 μg CpG 1668 (MWG, Ebersberg, Germany), or 50 μg polyI:C (Invivogen, San Diego, CA). Splenocytes were isolated after 16 h and stained with PDC-specific Abs and the Aw3.18 Ab, which specifically detects complexes of HEL-peptide and MHC II (pHEL/I-Ak) on the cell surface. CD4+ and CD8+ T cells were isolated from splenocytes by negative selection using MACS isolation kits (Miltenyi Biotech, Bergisch Gladbach, Germany). Isolated OT-I and OT-II T cells were labeled with 5 μM CFSE, and 2 × 106 to 4 × 106 cells per mouse were transferred to C57BL/6 mice by i.v. injection. Recipient mice were immunized i.p. with 10 μg chimeric anti-BST2–OVA or anti-DEC205–OVA Abs 24 h later. T cell proliferation was analyzed in the spleen 4 d after immunization. Mice were injected with 300 μg anti–Gr-1 Ab i.p. to deplete PDCs and were immunized 24 h later with anti-BST2–OVA/polyI:C. After 8 h, CD11c+ cells were enriched from splenocytes by MACS using CD11c microbeads (Miltenyi Biotec) and cocultured with CFSE-labeled OT-I T cells for 72 h (DC numbers as indicated, 105 T cells per well). T cell proliferation was measured by CFSE dilution. C57BL/6 mice were immunized once or twice with an interval of 14 d by i.p. injection of 10 μg of the indicated Ab–OVA fusion proteins either without adjuvant or in combination with 10 μg CpG 1668 or 50 μg polyI:C. Anti-OVA Ab titers were determined in the serum on day 14 before the boost and on day 21, 1 wk after the boost. To detect OVA-specific CD4+ T cell responses, splenocytes were isolated 1 wk after the boost on day 21, and MACS-enriched CD4+ T cells were restimulated with OVA-pulsed CD11c+ DCs for 6 h in the presence of GolgiPlug and GolgiStop (BD Biosciences) according to the manufacturer’s protocol. To determine CD8+ T cell responses in vivo, killing assays were performed 1 wk after the boost on day 21. Briefly, splenocytes were pulsed with SIINFEKL peptide (500 nM) for 3 h and labeled with 0.1 μM CFSE or not pulsed and labeled with 1 μM CFSE. An equal number of cells (1 × 107) of each population was transferred to immunized mice, and specific killing was quantified 16 h later in spleens as described (35). C57BL/6 mice were immunized as described earlier. Control groups received 50 μg polyI:C alone. Eight weeks after the last immunization, mice were challenged intranasally with 3 × 104 PFU recombinant vaccinia virus encoding for OVA (VV-OVA) diluted in 30 μl PBS and monitored for 2 wk with daily measurement of individual body weights (4). The mean change in body weight was calculated as the percentage of the mean weight for each group on the day of challenge. VV-OVA (originally provided by J. Yewdell, National Institutes of Health, Bethesda, MD) was propagated, purified, and titrated following standard methodology. Mice were immunized as described earlier. OVA-expressing B16 melanoma cells (1 × 106) were injected s.c. in the flank 14 d after immunization, and tumor growth was monitored (4). Mice were euthanized when tumor size exceeded 225 mm2. Total splenocytes were incubated in vitro with 5 μg/ml SIINFEKL to restimulate CD8+ T cells or with a combination of 5 μg/ml OVA peptide (aa 323–339) and 5 μg/ml OVA peptide (aa 265–279) to restimulate CD4+ T cells for 6 h in the presence of GolgiPlug and GolgiStop (BD Biosciences) and then stained intracellularly for IFN-γ, IL-4, and IL-2. All peptides were purchased from GenScript (Piscataway, NJ). ELISA for OVA-specific IgG Abs was performed according to the ELISA protocol provided by BD Biosciences. Briefly, Maxisorb ELISA plates (Nunc, Roskilde, Denmark) were coated with 5 μg/ml OVA (Hyglos, Regensburg, Germany). After washing and blocking, plates were incubated with 2-fold serial dilutions of collected sera. For detection, biotinylated anti-mouse IgG1, IgG2b, and IgG2c Abs (1 μg/ml; BD Biosciences) and streptavidin–HRP (1:3000; GE Healthcare) were used. ABTS was used as substrate (Roche, Basel, Switzerland), and the reaction was stopped by adding 1% SDS. Absorbance was measured at 405 nm. Titers represent the highest dilution of serum showing an OD405 > 0.1. BST2 is highly expressed on murine PDCs (Supplemental Fig. 1B) (36, 37) and is therefore a promising target for delivering Ags to PDCs. We could show that purified recombinant anti-BST2 Ab fused with OVA as Ag (Supplemental Fig. 1A) binds specifically to PDCs whereas an isotype control Ab does not (Supplemental Fig. 1C). Depletion activity of the monoclonal rat anti-BST2 Ab is lost in the recombinant anti-BST2 Ab, which has a mutation in the Fc part (Supplemental Fig. 1D). BST2 is also expressed in other cell types upon stimulation with type I IFN (37). We found that BST2 was clearly expressed on the majority of splenocytes 16 h after injection of polyI:C, but only a very small shift of the BST2 staining signal was detected in splenocytes at 4 h after injection of polyI:C (Supplemental Fig. 2, histograms on the right). However, we found that the recombinant anti-BST2–OVA Ab is bound exclusively to the surface of PDCs at 4 h and not detectable at later time points after injection even when coadministered with polyI:C or CpG (Supplemental Fig. 2, anti-mIgG1 staining). Thus, binding of the injected anti-BST2 Ab precedes upregulation of BST2 expression by coadministered adjuvants. CDCs or other APCs are therefore not directly targeted by the anti-BST2 Ab in vivo even in the presence of adjuvants. We next investigated whether Ag presentation on MHC II is specific for PDCs after Ag targeting to BST2 and simultaneous administration of adjuvants. For this purpose, C3H mice were immunized twice with an interval of 14 d with 20 μg anti-BST2–pHEL without adjuvant or in combination with CpG 1668 or polyI:C. Presence of pHEL/I-Ak complexes on the surfaces of splenocytes was measured by FACS 16 h later. Even after two immunizations with anti-BST2–pHEL in the presence of CpG or polyI:C as adjuvant, pHEL/I-Ak complexes were detected exclusively on PDCs but not on CDCs, B cells, or remaining APCs in the spleen (Fig. 1A, 1B) and in lymph nodes (data not shown). pHEL/I-Ak complexes were not detectable at later time points after immunization in any of the cell populations even in the presence of adjuvants (Supplemental Fig. 3). Ag presentation was restricted to CCR9+ PDCs and not detected in CCR9− PDCs in both spleen and lymph nodes (Fig. 1B and data not shown). The use of CpG 1668 and polyI:C as adjuvant increased expression of the costimulatory molecule CD86 on PDCs. Thus, BST2 is a suitable target to deliver Ag specifically to PDCs for presentation on MHC II even in the presence of IFN-inducing TLR agonists as adjuvants. BST2-mediated Ag delivery results in PDC-specific Ag presentation. anti-BST2–pHEL (20 μg) was injected in C3H mice i.p. with or without 10 μg CpG 1668 or 50 μg polyI:C on days 0 and 14. pHEL/I-Ak complexes were detected on splenocyte subpopulations 16 h after the second injection. A, Splenic PDCs were defined as CD11clow B220+ Siglec-H+, CDCs as CD11chigh Siglec-H−, B cells as B220+ Siglec-H−, and non-PDCs as Siglec-H−. B, pHEL/I-Ak formation on the surfaces of PDCs, CDCs, B cells, and non-PDCs after treatment with anti-BST2–pHEL (open histograms) or application of PBS (gray-shaded histograms). For PDCs, expression of CD86 is also displayed as a histogram. Numbers in histograms indicate the mean fluorescence intensity. Dot plots show correlation of pHEL/I-Ak formation and CCR9 expression in PDCs. The percentages are indicated in the quadrants. One representative of three independent experiments is shown. To investigate whether Ag presentation is also followed by activation of Ag-specific T cells, we adoptively transferred CFSE-labeled OVA-TCR-transgenic CD8+ OT-I and CD4+ OT-II T cells into C57BL/6 mice. These recipients were then immunized i.p. with 10 μg anti-BST2–OVA with or without CpG 1668 or polyI:C. Proliferation of OT-I and OT-II T cells was measured by CFSE dilution 4 d later. Isotype-OVA control Ab did not induce OT-I or OT-II cell proliferation (Supplemental Fig. 4A). Almost 100% of the CD8+ OT-I T cells proliferated in response to anti-BST2–OVA with or without adjuvant (Fig. 2A, left panels). 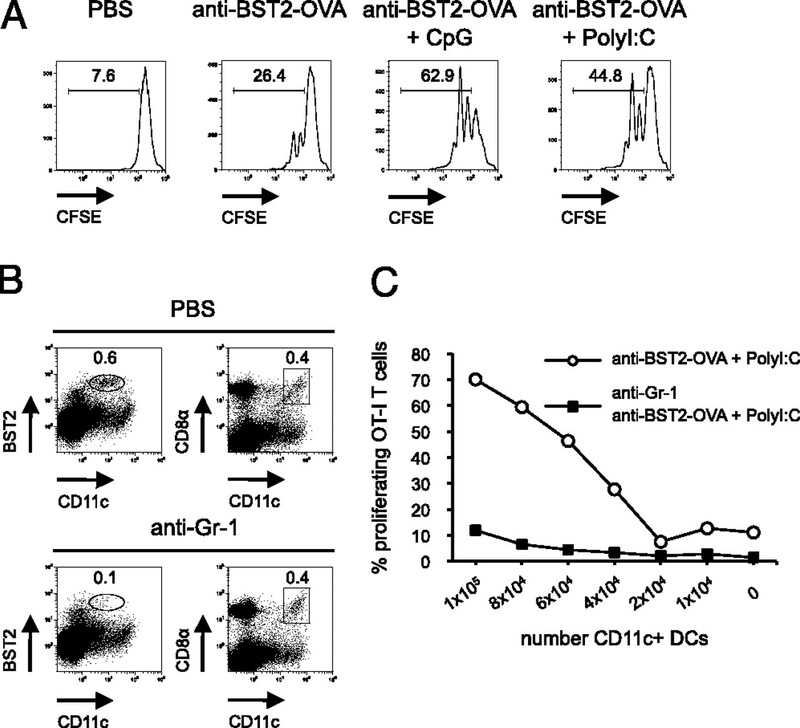 In the absence of adjuvants, OT-I T cells were expanded by immunization with anti-BST2–OVA ∼7-fold compared with mice that had been injected with PBS alone. CpG 1668 slightly increased and polyI:C strongly increased expansion of OT-I T cells (Fig. 2B). 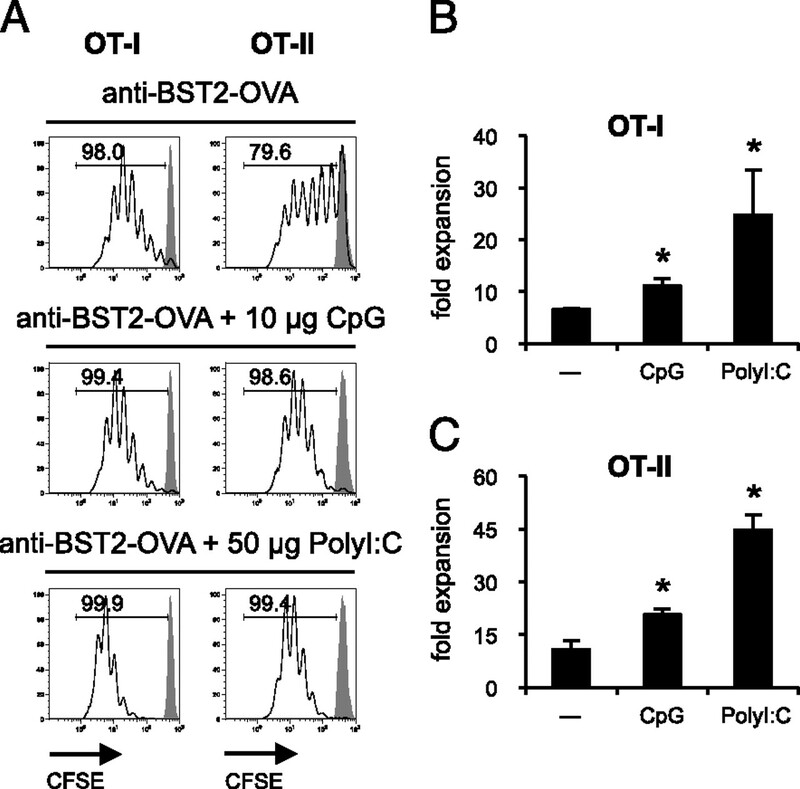 Immunization with anti-BST2–OVA also efficiently induced proliferation and expansion of CD4+ OT-II T cells, which was further increased by CpG or polyI:C (Fig. 2A, right panels, 2C). We therefore conclude that BST2-mediated Ag delivery to PDCs elicits priming of Ag-specific CD4+ and CD8+ T cells, which is significantly enhanced by coadministration of CpG or polyI:C as adjuvant. Ag presentation by PDCs induces proliferation and expansion of transferred Ag-specific CD4+ and CD8+ T cells. C57BL/6 mice that had received CSFE-labeled CD8+ OT-I or CD4+ OT-II T cells were immunized i.p. with 10 μg anti-BST2–OVA with or without CpG 1668 or polyI:C. T cell responses were analyzed in the spleen 4 d after immunization. A, T cell proliferation was assayed by CFSE dilution. Numbers in the histograms indicate the percentage of transferred T cells that had divided (open histograms, anti-BST2–OVA; gray-shaded histograms, PBS). B and C, Bar graphs show the expansion of OT-I (B) and OT-II (C) T cells as fold expansion in relation to mice that had received PBS as control. Displayed are the means ± SD of three independent experiments. Asterisks indicate statistically significant difference to control without adjuvant (*p < 0.05, Student t test). The ability of PDCs to cross-present Ags to CD8+ T cells is controversial, and staining with the 25-D1.16 Ab was not sensitive enough to detect SIINFEKL–MHC class I (MHC I) complexes on the cell surface after DC targeting (data not shown). As shown in Fig. 3A, however, OT-I T cells proliferated after coculture with isolated PDCs treated with anti-BST2–OVA alone or together with CpG or polyI:C in vitro thus providing evidence for direct cross-presentation of the Ag by PDCs. CD11c+ cells isolated from splenocytes of mice that had been depleted of PDCs using the anti–Gr-1 Ab and immunized with anti-BST2–OVA/polyI:C were unable to induce OT-I T cell proliferation demonstrating that PDCs were required for the cross-priming (Fig. 3B, 3C). PDCs cross-present Ag targeted to BST2. A, PDCs were isolated from WT C57BL/6 splenocytes by FACS sorting. PDCs (1 × 104) were cocultivated with 1 × 105 CFSE-labeled OT-I T cells in the presence of 500 ng/ml anti-BST2–OVA either without adjuvant or in the presence of 1 μg/ml CpG 1668 or 10 μg/ml polyI:C. Coculture of PDCs and OT-I T cells in the absence of anti-BST2–OVA served as control. B and C, Mice were injected with 300 μg anti–Gr-1 i.p. to deplete PDCs. anti–Gr-1–treated or nontreated mice were subsequently immunized with 10 μg anti-BST2–OVA and 50 μg polyI:C i.p. 24 h later. Splenocytes were isolated 8 h after immunization. B, The percentage of CD11c+ BST2+ PDCs and CD11c+ CD8α+ CDCs in anti–Gr-1–treated or nontreated mice is shown. C, CD11c+ splenic DCs were enriched with MACS beads 8 h after immunization and cocultured with CFSE-labeled CD8+ OT-I T cells for 72 h. The percentage of proliferating T cells was determined by CFSE dilution. Graph displays proliferation of OT-I T cells in response to graded numbers of CD11c enriched DCs. Successful vaccines induce expansion and acquisition of effector function of endogenous Ag-specific T and B cells in naive mice with a polyclonal T and B cell repertoire. To test if an immunization with Ag-carrying BST2 Abs induces long-lasting and protective immune responses, we immunized mice twice i.p. with anti-BST2–OVA in combination with CpG 1668 or polyI:C with an interval of 14 d (Fig. 4A). We used anti-DEC205–OVA together with polyI:C as a positive control for the induction of a strong Ag-specific Th, CTL, and humoral immune response. The high efficiency and quality of this immunization strategy has been demonstrated previously in several studies (7, 8, 38). To determine anti-OVA Ab titers, we collected serum samples before the boost (day 14) and 1 wk after the boost (day 21). At this time point (day 21), mice were sacrificed and T cell responses were analyzed in the spleen. After in vitro restimulation of splenic CD4+ T cells with OVA-pulsed DCs, the highest frequency of IFN-γ–producing CD4+ T cells was found in mice that had received anti-BST2–OVA in combination with polyI:C (Fig. 4B). The frequency of CD4+ T cells producing IL-4 after restimulation with OVA-pulsed DCs was very low in all conditions tested. Thus, immunization with anti-BST2–OVA together with adjuvant is efficient in inducing a strong Th1 response. We also detected high titers of OVA-specific Abs in the serum already 14 d after the first immunization that further increased after the boost (Fig. 4C). A broad range of IgG isotypes was detected including IgG2b and IgG2c Abs reflecting the efficient Th1 response that was elicited by this immunization strategy. Immunization with anti-BST2–OVA in the absence of adjuvant and treatment with isotype-OVA control Ab together with adjuvant failed to induce significant OVA-specific Ab responses (shown exemplarily for IgG2b in Supplemental Fig. 4B). To investigate if immunization with anti-BST2–OVA together with polyI:C or CpG also efficiently induced CD8+ T cells with cytolytic function in vivo, we transferred a combination of SIINFEKL-pulsed and unpulsed syngeneic splenocytes labeled with different concentrations of CFSE 6 d after the second immunization (day 20). Specific eradication of SIINFEKL-pulsed target cells was determined after 16 h. CTLs induced by immunization with anti-BST2–OVA/polyI:C were as efficient in killing target cells as CTLs induced by anti-DEC205–OVA/polyI:C. CpG 1668 (10 μg i.p.) was a weak adjuvant for anti-BST2–OVA immunization especially with respect to CTL induction (Fig. 4D). We conclude that in combination with polyI:C as adjuvant, Ag delivery to PDCs via BST2 is at least as efficient as Ag delivery to CD8α+ DCs via DEC205 in inducing strong Th1, CTL, and humoral immune responses. Immunization of C57BL/6 mice with anti-BST2–OVA results in strong endogenous T cell responses and high titers of specific Abs. A, Mice were immunized twice with a 14-d interval with the respective Abs and indicated adjuvants. To determine Ab titers, serum was collected on day 14 (before the boost) and day 21 (1 wk after the boost), and mice were sacrificed at this time point to determine T cell responses in the spleen. B, MACS-enriched CD4+ T cells were restimulated in vitro with OVA-pulsed CD11c+ DCs. Dot plots show frequencies of IFN-γ– and IL-4–producing CD4+ T cells. Displayed are the results of one representative of three independent experiments. C, Titers and isotypes of OVA-specific Abs were determined on days 14 and 21. Displayed are the means ± SD of one representative experiment with 5–10 animals per group. D, In vivo killing of Ag-loaded target cells was assayed at day 21. Syngeneic splenocytes were pulsed with SIINFEKL peptide (500 nM) for 3 h and labeled with 0.1 μM CFSE. Unpulsed cells were labeled with 1 μM CFSE. Cells (1 × 107) of each population were injected together i.v., and specific lysis was quantified 16 h later in the spleen. To demonstrate the involvement of PDCs in the immune responses elicited by Ag delivery to BST2 in vivo, PDCs were depleted using the anti–Gr-1 Ab at the time of the first and second immunization with anti-BST2–OVA/polyI:C (depletion efficiency shown in Supplemental Fig. 1D). PDC depletion strongly reduced anti-OVA Ab titers (IgG1, IgG2b, IgG2c) by approximately 2 log steps and significantly diminished, but did not entirely abrogate, the in vivo killing of OVA-pulsed target cells (Supplemental Fig. 4C, 4D). Thus, we can show that PDCs are responsible for a large part of the T and B cell responses elicited by anti-BST2–OVA/polyI:C immunization. To investigate whether Ag targeting to PDCs via BST2 together with polyI:C as adjuvant can induce protective immune responses, we chose the intranasal vaccinia virus infection model using VV-OVA. The prime boost protocol used in previous experiments was compared with a single i.p. injection of anti-BST2–OVA/polyI:C. To control for unspecific protective effects of the adjuvant, control groups received one or two injections of polyI:C alone. Mice were infected intranasally with 3 × 104 PFU VV-OVA 8 wk after the last immunization. We chose a sublethal dose of VV-OVA that allowed us to monitor loss and recovery of body weight for 14 d and subsequent analysis of T cell responses. Mice that had received one dose of anti-BST2–OVA/polyI:C lost only little weight and regained the weight they had before infection already on day 8 postinfection. In comparison, mice that had received one injection of polyI:C alone lost significantly more body weight and did not fully recover even after 14 d (Fig. 5A). Similar results were obtained when mice had received the prime and boost vaccination (Fig. 5B). 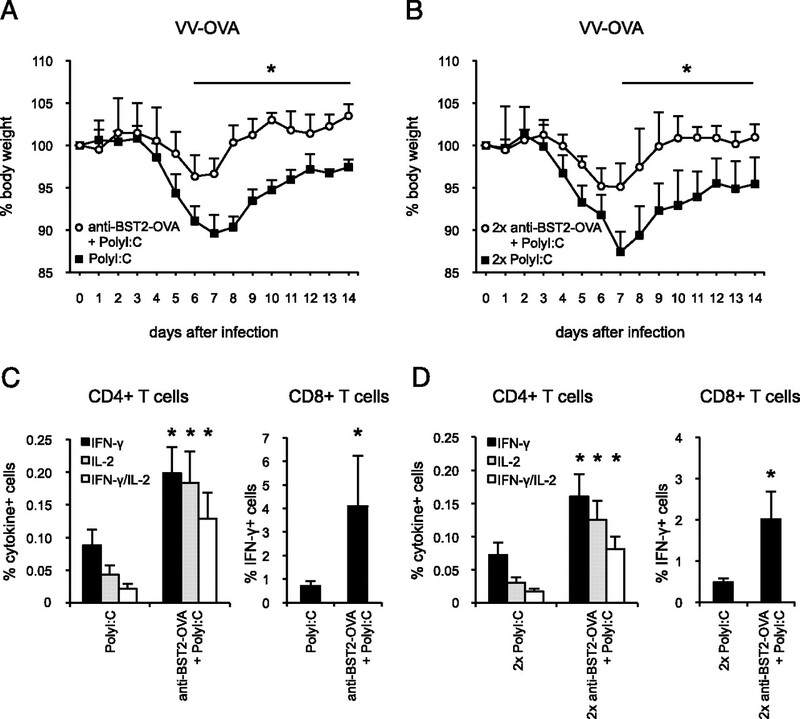 The protective effect of the anti-BST–OVA/polyI:C immunization correlated with a significantly higher frequency of CD4+ T cells that produced IFN-γ and/or IL-2 in response to restimulation with OVA peptides 14 d after VV-OVA infection (Fig. 5C, 5D). In addition, a significantly higher percentage of CD8+ T cells producing IFN-γ in response to OVA peptide restimulation was detected after viral challenge in mice that had been immunized with anti-BST2–OVA/polyI:C compared with that in mice that had received only polyI:C (Fig. 5C, 5D). Our results show that systemic administration of a single dose of anti-BST2–OVA/polyI:C was sufficient to induce long-lasting protective antiviral T cell responses. Immunization with anti-BST2–OVA protects mice from weight loss in sublethal infection with OVA-encoding vaccinia virus. Mice were immunized either once (A, C) or twice (B, D) with anti-BST2–OVA/polyI:C or polyI:C alone. Eight weeks after the last immunization, mice were infected intranasally with 3 × 104 PFU VV-OVA. A and B display the loss of body weight compared with the weight before infection (mean ± SD, n = 6 mice per group). Asterisks indicate statistically significant differences between the two groups (*p < 0.05, Student t test). C and D show the frequency of OVA-specific IFN-γ+, IL-2+, and IFN-γ/IL-2+ CD4+ T cells and frequency of IFN-γ+ CD8+ T cells 14 d after viral challenge (mean ± SD, n = 6 mice per group). Asterisks inidicate statistically significant differences between the two groups—polyI:C alone and anti–BST2-OVA/polyI:C (*p < 0.05, Student t test). Efficient antitumor immunity requires strong Th1 and CTL responses. We therefore investigated if immunization with anti-BST2–OVA/polyI:C confers resistance against the growth of an OVA-expressing melanoma (B16-OVA). For this study, mice were injected i.p. with a single dose of anti-BST2–OVA in combination with polyI:C or with polyI:C alone. After 14 d, 1 × 106 B16-OVA cells were implanted s.c. Mice that had received only polyI:C developed rapidly growing tumors leading to sacrifice of the mice 18 d after injection of the tumor cells. In contrast to that, mice that had been immunized with anti-BST2–OVA in combination with polyI:C developed only very small and slow-growing tumors (Fig. 6A). The observed reduction in tumor growth correlated with increased survival of mice that had been injected with anti-BST2–OVA/polyI:C compared with that of mice that had received only polyI:C (Fig. 6B). BST2-mediated Ag delivery to PDCs together with polyI:C as adjuvant therefore protected mice from growth of a transplanted syngeneic Ag-expressing tumor. Anti-BST2–OVA mediated immunization confers resistance to tumor growth. A, Mice were immunized i.p. with anti-BST2–OVA/polyI:C or polyI:C alone. Two weeks later, mice were injected s.c. with 1 × 106 B16-OVA melanoma cells, and the growth of the tumor was monitored at the indicated time points (mean ± SD, n = 6 mice per group). B, Survival after tumor implantation is shown (n = 6 mice per group). In this study, we show that Ag targeting to PDCs in conjunction with adjuvant is capable of inducing effective immune responses in vivo, which confer Ag-specific protection against viral infection and tumor growth. To target model Ags specifically to murine PDCs in vivo, we have chosen BST2/CD317 as target molecule, which is expressed at high levels on the surfaces of murine PDCs (15). BST2 expression is specific for PDCs in naive mice but is upregulated on many cell types after stimulation with type I or type II IFNs, although expression is still significantly higher in PDCs after stimulation (37). We found that despite the promiscuous expression of BST2 induced by stimulation, MHC II presentation of Ag fused to anti-BST2 Ab was nevertheless restricted to PDCs even when a prime boost immunization protocol including a strong IFN-inducing adjuvant (CpG or polyI:C) was used. This preservation of specificity may be due to the fact that binding of the injected anti-BST2 Ab precedes upregulation of BST2 expression by the coadministered adjuvants. In addition, the higher expression levels of BST2 in PDCs or the more efficient internalization, trafficking, and loading onto MHC II in PDCs compared with other APCs could further contribute to the specificity of this Ag targeting strategy. It has been proposed that CCR9 expression distinguishes functionally different subpopulations of PDCs. CCR9− PDCs may develop into CDC-like cell type with higher Ag presentation capacity (29, 39, 40). However, after Ag delivery via BST2, we detected peptide–MHC II complexes only on CCR9+ but not CCR9− PDCs excluding a role for CCR9− PDCs in Ag presentation on MHC II after BST2-mediated Ag delivery. Because direct detection of peptide–MHC I complexes on the cell surface after Ag targeting to BST2 was not successful due to low sensitivity of the available Ab, specificity of BST2 targeting for Ag presentation of MHC I by PDCs was shown indirectly by the lack of OT-I T cell proliferation in response to CD11c+ cells isolated from spleens of PDC-depleted mice that had been immunized with anti-BST2–OVA/polyI:C. PDC-specific Ag presentation in vivo was therefore achieved in our study by targeting Ag to BST2 even in the presence of immunostimulatory adjuvant. It has been shown that PDCs are rather poor at priming naive T cells in the absence of adequate stimulation but are capable of inducing T cell responses if they are activated by TLR agonists or viral infection (20). In our study, we demonstrate that transferred naive TCR-transgenic CD4+ and CD8+ T cells are sufficiently activated to proliferate after Ag targeting to PDCs via BST2 in the absence of stimulation, which is further enhanced by simultaneous treatment with CpG and especially polyI:C. Nevertheless, in the absence of adjuvant, immunization with anti-BST2–OVA was unable to induce significant titers of anti-OVA Abs or T cell responses (Supplemental Fig. 4 and data not shown). Our results therefore show that BST2-mediated Ag delivery to PDCs by itself is sufficient to induce initial T cell priming, but further expansion and differentiation to effector cells requires additional stimulation by adjuvant. In addition to CpG, which directly activates PDCs, we used polyI:C as adjuvant. PolyI:C triggers a strong systemic type I IFN response, which is the basis of its potent adjuvant activity (38). Type I IFN production in response to polyI:C is predominately mediated by triggering MDA5 in non-hematopoietic cells. For DC-targeted vaccines using anti-DEC205 Abs, polyI:C was shown to be superior to CpG due to its higher potential for type I IFN induction (38). We therefore used polyI:C in addition to CpG for direct comparison of BST2-mediated and DEC205-mediated immunization. Using polyI:C also allowed us to avoid potential interference of the anti-BST2 Ab with cytokine secretion by PDCs, which has been reported in vitro (37), as PDCs do not directly respond to polyI:C but are activated indirectly by type I IFN. In mice with a naive T and B cell repertoire, we could show that Ag delivery via BST2 together with CpG or polyI:C as adjuvants was efficient in inducing Th1 cells and high Ab titers with a broad range of IgG isotypes. BST2-targeted immunization together with CpG or polyI:C was similarly effective in this regard, as DEC205-targeted immunization combined with polyI:C, which has been shown to induce long-lasting protective CD4+ T cell immunity (7, 38). 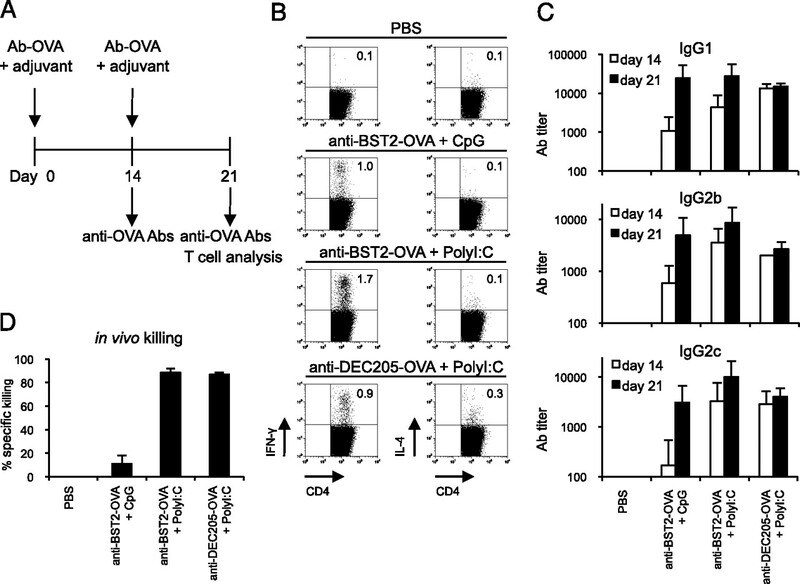 OVA-specific Ab responses were strongly reduced after PDC depletion using the anti–Gr-1 Ab during the priming and boosting immunization with anti-BST2–OVA/polyI:C suggesting that PDCs are responsible for the observed Th cell and Ab responses. Because neutrophil granulocytes, which are also depleted by anti–Gr-1, are not known to contribute to T cell priming, it is unlikely that granulocytes are responsible for the immune responses induced by Ag targeting to BST2. In our study, we could also demonstrate that BST2-mediated immunization induces functional Ag-specific CTLs and was similarly effective as DEC205-mediated immunization. PolyI:C was clearly the better adjuvant than CpG 1668, which is most likely due to its higher type I IFN-inducing capacity (41). We found that PDC depletion using the anti–Gr-1 Ab significantly reduced but not completely abrogated the in vivo CTL activity elicited by anti-BST2–OVA/polyI:C immunization. The residual CTL response observed in anti–Gr-1–treated mice is likely due to incomplete depletion of PDCs. Although we cannot exclude the contribution of other cells than PDCs, our data clearly demonstrate the major involvement of PDCs in the CTL response induced by Ag targeting to BST2 in vivo. Thus, to our knowledge, our study provides first evidence that Ag delivered to PDCs in the context of adjuvant stimulation is cross-presented in vivo leading to the generation of functional CTLs. The CD4+ and CD8+ T cell responses induced by BST2-mediated immunization together with polyI:C as adjuvant were translated into long-lasting protective antiviral immunity at a mucosal surface. A single immunization with anti-BST2–OVA/polyI:C administered systemically was sufficient to protect mice from weight loss postinfection with VV-OVA 8 wk later. The observed protection correlated with rapid expansion of OVA-specific CD4+ and CD8+ T cells after viral challenge suggesting that sufficient T cell memory including IFN-γ/IL-2–double-producing polyfunctional CD4+ T cells had been induced by this immunization strategy. It is likely that both the OVA-specific CD4+ and CD8+ T cell-mediated immunity contributes to the observed protection against VV-OVA infection as it has been shown for infection with wild-type virus (42), although the CD4+ T cell response appears to dominate the protective immune response in this model (8). BST2-mediated Ag delivery combined with polyI:C as adjuvant also provided resistance against a rapidly growing tumor (B16 melanoma) expressing the specific Ag, which requires both efficient CD4+ and CD8+ T cell responses (4). Only treatment with anti-BST2–OVA/polyI:C, but not polyI:C alone, induced protective antiviral and antitumoral immune responses. We can therefore exclude that protection conferred by anti-BST2–OVA immunization was mediated by unspecific innate immune effects of the adjuvant polyI:C itself. To our knowledge, our study is the first to show that Ag targeting to PDCs in vivo combined with TLR agonists as adjuvant is an effective vaccination strategy that induces long-lasting protective cellular and humoral immune responses. This result was not expected, because PDCs have been reported to be tolerogenic even under immunostimulatory conditions. We therefore conclude that the route of Ag delivery and the mode of adjuvant stimulation greatly influences the type of immune response that is induced by PDCs in vivo. Thus, PDCs similar to CDC subpopulations can be harnessed to design effective vaccines. This strategy might be especially useful for vaccination in humans where PDCs constitute a major subpopulation of DCs. We thank Jessica Batt and Annika Bosch for excellent technical assistance. We thank Marco Colonna and Giorgio Trinchieri for providing reagents. A.B.K., J.L., A.S., and W.R. were supported by German Research Foundation Grants KR2199/1-3, SFB 571, and KR2199/3-1. A.S. was supported by GRK1482 and TUM Graduate School. D.D. was supported by German Research Foundation Grant DU548/2-1, BayGene, and GRK1660 and is a fellow of the Förderkolleg of the Bavarian Academy of Sciences. C.B. was supported by BayImmuNet. I.D. was supported by German Research Foundation Grant 456 TP B7. This work is part of the thesis of J.L. recombinant vaccinia virus encoding for OVA.
. 2010. Designing vaccines based on biology of human dendritic cell subsets. Immunity 33: 464–478.
. 2009. Enhancing immune responses by targeting antigen to DC. Eur. J. Immunol. 39: 931–938.
. 2008. The microbial mimic poly IC induces durable and protective CD4+ T cell immunity together with a dendritic cell targeted vaccine. Proc. Natl. Acad. Sci. USA 105: 2574–2579.
. 2008. The dendritic cell subtype-restricted C-type lectin Clec9A is a target for vaccine enhancement. Blood 112: 3264–3273.
. 2006. Functional comparison of mouse CIRE/mouse DC-SIGN and human DC-SIGN. Int. Immunol. 18: 741–753.
. 2006. Preferential induction of CD4+ T cell responses through in vivo targeting of antigen to dendritic cell-associated C-type lectin-1. J. Immunol. 177: 2276–2284.
. 2009. The C-type lectin Clec12A present on mouse and human dendritic cells can serve as a target for antigen delivery and enhancement of antibody responses. J. Immunol. 182: 7587–7594.
. 2004. A cell-surface molecule selectively expressed on murine natural interferon-producing cells that blocks secretion of interferon-alpha. Blood 103: 4201–4206.
. 2007. Organ-dependent in vivo priming of naive CD4+, but not CD8+, T cells by plasmacytoid dendritic cells. J. Exp. Med. 204: 1923–1933.
. 2006. Characterization of Siglec-H as a novel endocytic receptor expressed on murine plasmacytoid dendritic cell precursors. Blood 107: 3600–3608.
. 2001. BDCA-2, a novel plasmacytoid dendritic cell-specific type II C-type lectin, mediates antigen capture and is a potent inhibitor of interferon alpha/beta induction. J. Exp. Med. 194: 1823–1834.
. 2005. Cell biology of antigen processing in vitro and in vivo. Annu. Rev. Immunol. 23: 975–1028.
. 2006. Plasmacytoid dendritic cells of melanoma patients present exogenous proteins to CD4+ T cells after Fc gamma RII-mediated uptake. J. Exp. Med. 203: 1629–1635.
. 2008. Targeting DCIR on human plasmacytoid dendritic cells results in antigen presentation and inhibits IFN-alpha production. Blood 111: 4245–4253.
. 2009. Plasmacytoid dendritic cells capture and cross-present viral antigens from influenza-virus exposed cells. PLoS ONE 4: e7111.
. 2004. Essential role of lung plasmacytoid dendritic cells in preventing asthmatic reactions to harmless inhaled antigen. J. Exp. Med. 200: 89–98.
. 2008. Plasmacytoid dendritic cells mediate oral tolerance. Immunity 29: 464–475.
. 2008. CCR9 expression defines tolerogenic plasmacytoid dendritic cells able to suppress acute graft-versus-host disease. Nat. Immunol. 9: 1253–1260.
. 2009. Plasmacytoid dendritic cells regulate breach of self-tolerance in autoimmune arthritis. J. Immunol. 182: 963–968.
. 2010. Superior antigen cross-presentation and XCR1 expression define human CD11c+CD141+ cells as homologues of mouse CD8+ dendritic cells. J. Exp. Med. 207: 1273–1281.
. 2010. 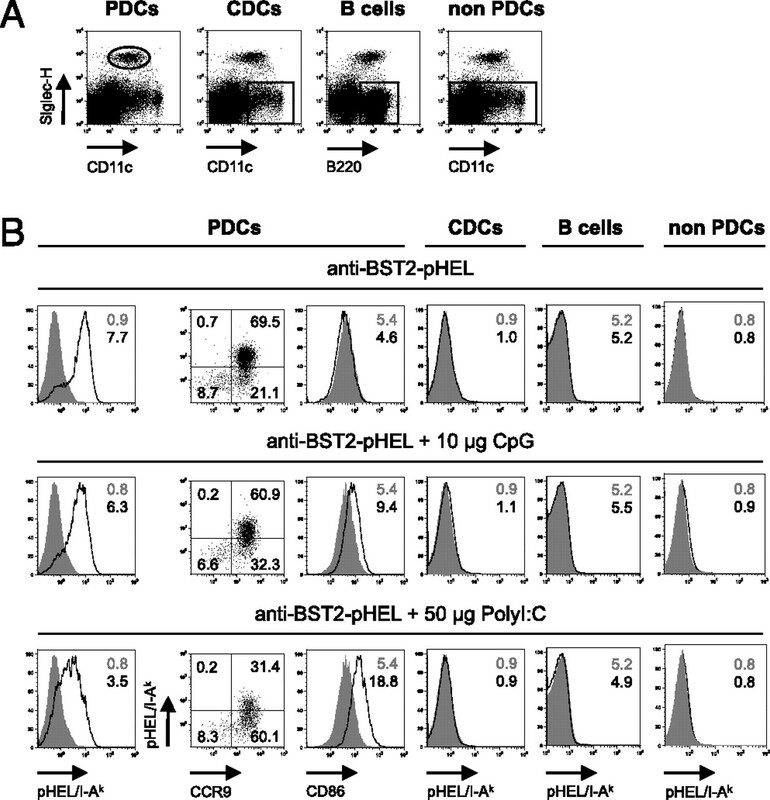 Characterization of human DNGR-1+ BDCA3+ leukocytes as putative equivalents of mouse CD8alpha+ dendritic cells. J. Exp. Med. 207: 1261–1271.
. 2001. Phenotypic and functional analysis of CD8(+) T cells undergoing peripheral deletion in response to cross-presentation of self-antigen. J. Exp. Med. 194: 707–717.
. 2001. Mouse type I IFN-producing cells are immature APCs with plasmacytoid morphology. Nat. Immunol. 2: 1144–1150.
. 2006. Bone marrow stromal cell antigen 2 is a specific marker of type I IFN-producing cells in the naive mouse, but a promiscuous cell surface antigen following IFN stimulation. J. Immunol. 177: 3260–3265.
. 2009. Dendritic cells require a systemic type I interferon response to mature and induce CD4+ Th1 immunity with poly IC as adjuvant. J. Exp. Med. 206: 1589–1602.
. 2009. Cutting edge: B220+CCR9- dendritic cells are not plasmacytoid dendritic cells but are precursors of conventional dendritic cells. J. Immunol. 183: 1514–1517.
. 2011. Identification of CCR9- murine plasmacytoid DC precursors with plasticity to differentiate into conventional DCs. Blood. DOI: 10.1182./blood-2010-12-326678.
. 2008. Targeting poly(I:C) to the TLR3-independent pathway boosts effector CD8 T cell differentiation through IFN-alpha/beta. J. Immunol. 181: 7670–7680.
. 2004. Cellular and humoral immunity against vaccinia virus infection of mice. J. Immunol. 172: 6265–6271.